Don't worry, I'm dropping it. Nothing more from me. I could have written "Juno" which is a new movie that's getting great reviews. The teams with the potentially biggest problems are Nicolas/Donald, who will have to get one more to Donald(but otherwise benefit from the Fast Forward), and TK&Rachel, who will need to have Rachel do one more than TK to get balanced. With the screen shots for this coming episode we (and if it's a roadblock, which it really has to be). We can add one more for Nathan, One more for Rachel, one more for Ronald. We haven't seen footage yet with Nic and Don (though if this is some passive roadblock, like skydiving, then it would be wise to use Don to burn his last required roadblock). Where in the rules of play does it say that roadblocks must be evenly done by both team members? Since TAR6 Gman, 6 a piece. 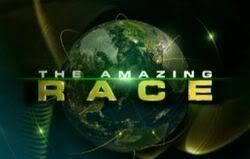 Beginning in Season 6, each team member may complete a maximum of only six Roadblocks throughout the entire race. Since there are normally twelve Roadblocks in the Race, this rule forces each team to split the Roadblocks equally between the two members (unless a team uses a Fast Forward to skip one Roadblock, in which case the split can be 6-5, if they somehow manage to get two Fast Forwards like Danny and Oswald did in Season 11, the split can possibly be 6-4). In contrast, Season 5's final three teams featured three male-female teams that split the Roadblocks 9-1 or 8-1 (not including unaired Roadblocks), with the male member of the team taking the load; many speculate that it was for this reason that the six-Roadblock rule was introduced in Season 6. The six-Roadblock limit was dropped for only Season 8; additionally, that season's four-member-team format required some Roadblocks to be completed by two people. Season 10 had 13 Roadblocks; therefore, the maximum for each team member was increased to seven. While this Roadblock rule has not been specifically mentioned in some later seasons, team behavior and statements (such as Eric in All-Stars) imply that it still applies. This is known as the Flo Rule as Flo did what amounted to one Road Block while Zach did 30. Totally unfair. Then the rule when instituted to even things out and I think it's a good rule. By the way, Jewel is hot. Bowling Mom rule I always heard... since they got gypped and all! it is the bowling moms rule. it was them and also in tar4 where tian and jaree where eliminated because of male dominated tasks. since then they made the equal roadblock rule and have had tasks which is fit for both a male and female. I think the unfair task in the final 4 is only part of the story. generally I think the rule came because season five final 3 were entirely composed from strong male/weak female teams while the 3 female teams where eliminated in row just because the the men of the male/female teams did everything while the women just road cotails(in 3 cases the women had done only one roadblock). if that rule had been applied in this season I think Brandon&Nicole and Chip&Kim would have been eliminated earlier and the moms and Mirna&Charla be in the finale. it's a shame that since that season except for Dustin&Kendice or maybe Lyn&Karlyn they didn't cast any women team with an actual chance of winning. Tian&Jeree were eliminated because Jeree held the team back and not for an "unfair task", they were Lucky to make it this far, they were a bad team. I think TAR 6 started it because in TAR 5 Chip and Kim Chip did like 9 and Kim did 1 so it was dumb and TAR 4 Kelly and Jon Kelly did 2 and Jon did 10 so that was worse!! There was a bad disparity among teams before the Road Block rule was instituted. I think it's much more fair now. Lol, the most accurate conclusion would be that each female in the F3 for TAR5 only completed one roadblock. This is the TAR 12 spoiler thread, right? Or did I get lost along the way somewhere?